Yoga balances the mind, body and spirit. Joseph Pilates was very clear that his exercises (“contrology”) were for that, too. In his own words, “Contrology is the complete coordination of body, mind and spirit.” from J. Pilates’ book Return to Life Through Contrology. Class Descriptions >> Click the plus icon below to read more! This is the entry-level equipment class. I recommend starting with a consultation if you’ve never tried Pilates equipment before or if you have a lot of questions or need to move at a slower pace. A consultation may be scheduled online. In this class, Level 1 and 2 exercises are taught. We move a lot, and learn to activate our core through using the Pilates equipment. 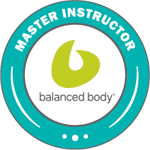 You will gain an understanding of Pilates concepts and language. Which equipment we use will rotate from class to class. Even if you’ve been doing Pilates for a while, this can be a great class to come in to energize and wake up posture muscles. You’re ready for this class if you’ve been doing the Beginning Equipment classes for a while, your core is awoken, and you want to learn more technique and a bigger repertoire. We focus on the Level 1, 2, and 3 exercises. This is a very hard class for those who have mastered levels 1 and 2 and have a good working understanding of level 3. We focus on the level 3 and 4 exercises and beyond. There is emphasis on flow and linking movements. This is not a beginning Pilates class but a beginning to Jumping and flying exercises on the reformer. Proficiency in Beginning Pilates required. In this class, we learn proper jumping technique for the health of our hips, knees, ankles and feet. You will begin to learn the vast repertoire of landing positions, flight patterns, and jumping speeds. This class is cardio-vigorous, but we do get off our backs and into other Pilates exercises as well. 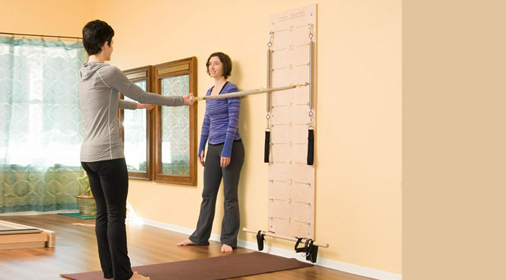 CoreAlign® is an amazing piece of modern equipment designed with Pilates principles in mind. It is mostly done with upright posture, so it is the perfect place to add in gait work, balance work and posture work. We can safely add in cardio for our heart and lung health, too. If you have never tried the CoreAlign and are not sure what it could do for you, a consultation will give you a half-hour test ride. 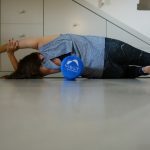 You can try some of the exercises and get a feel for how it affects your body and lifts and lengthens your core muscles. There are many people who can happily and safely use the CoreAlign, but a class pace seems too fast; so it is good idea to get a feel for the equipment first. If you are recovering from injury, a consultation is also a good starting point. CoreAlign can be used for rehabilitation, for deepening your sport, toning your posture, and activating your core and pelvic floor. When you’re ready to move into group classes, you are in for some fun! Group classes have a varied tempo, and we can even work some cardio moments in as our proficiency increases. The exercises and positioning on the equipment are many, so you will get a full-body work out. 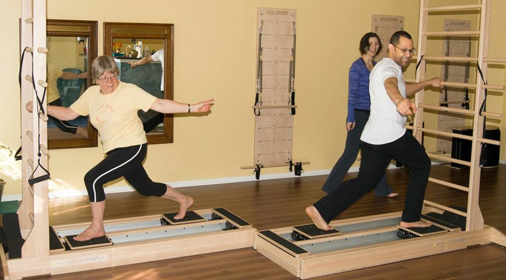 The CoreAlign is a wonderful place to work on improving gait, and it often takes your Pilates skills into a more upright position so you can transition them to your daily activities and your sports. 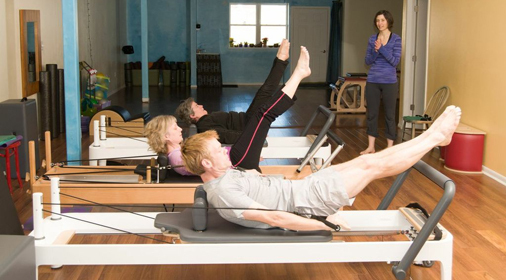 When you are ready to take it to the next step, Jules Pilates offers teacher training on the CoreAlign®. Physical therapists, Pilates teachers, dancers, athletic coaches and movement professionals can train their clients and their staff to safely use this amazing and versatile piece of equipment for health and happiness. The training is broken into two parts: Foundations and Progressions. Each training includes in-depth discussion and practice of movement principles, equipment and exercise set up. You will also learn and practice the exercise techniques and practice teaching them. There is an open-book exam. Both Foundations and Progressions are given over the course of a weekend. Expect to work hard and learn a lot. You will want to plan time after the courses to hone your new skills— moving on the equipment and teaching. You may schedule a skills and knowledge test (“test out”) when you complete your practice, observation and teaching hours to certify that you are CoreAlign® teaching ready! Courses will be offered with an early-bird registration. Register early to receive your training manual and video ahead of time. You will want to peek through your manuals prior to your training as there is a wealth of information in there. It helps to get an idea of how the manual is set up and how the exercises are written out for you. Pilates mat work focusing on gently and safely waking up the core with Pilates essential moves. The meat and potatoes of Pilates’ students. Students will learn the pre-Pilates and classic exercises of mat Pilates in order to access core musculature. Variations and modifications are taught, and props may be used. Examples of props for mat classes are stretchy bands, magic circles, stability balls, small balls and foam rollers. This class is for people who are surviving the traumas that life brings. Some survivors have or have had cancer. Some have had other illnesses or chronic illness. Some survivors are family or friends of those folks. Some of us survivors are just trying to figure out how to move in a continually aging body. We move, we ache and groan, we laugh, once in a while we cry. We definitely add in breath, meditation, self-acceptance and humor. The focus of practice is awareness, health & freedom. Witnessing our habitual reactions and perspective, and choosing whether to have them or not have them, is movement toward uncovering our already free self. Mind AND body flexible, strong, imaginative, living well both within your culture or, if you choose, beyond culture, era, ego and circumstance. Count on a uniquely gentle teaching of this sequence and kind encouragement in a class that respects silliness, seriousness and independent, explorative creativity. Bishnu Ghosh (the brother of Paramahansa Yogananda whose book “Autobiography of a Yogi” introduced millions to Kriya Yoga, meditation and, eventually, The Self Realization Fellowship), was a famous Physical Culturist in India, living 1903-1970. He developed a well-researched 26 pose + 2 breathing techniques sequence. While a sequence of poses tailored to the ailments of a specific individual was best, the intention was, and is, to offer a sequence that might give the most benefit to the most people. One of his top students, Bikram Choudhury, was sent to Japan and to the USA to teach it. It became known as Bikram Yoga and is the original “hot yoga”. Physical problems and pain are often the result of chronically tight muscles. The ongoing tightness begins to affect skeletal alignment–which then pulls on other muscles, puts pressure on joints, and may affect internal organs, breathing, blood flow, etc. In short, a contraction pattern can be the source, the cause, of all kinds of issues we are dealing with today. Somatic education, taught in the T. Hanna tradition, aims to end this cycle. While this class will vary in exercises, the intention is to teach every person the core sequence that resets the brain and body to a relaxed state each day. Somatic Movement offers slow, re-educational movements which cause the sensory/motor neuron tract in the Cortex (part of the brain where we learn) to become aware of muscular tension that has become so familiar that the Cortex “forgot” about it. In Somatics, this is called SMA, Sensory Motor Amnesia. Familiar physical patterns move to the Sub-Cortex where they will not change until told to by the sensory/motor tract in the Cortex. In the case of walking, ice skating, holding a spoon, etc., it is excellent that the familiar and learned movement moves to the Sub-Cortex. It allows us incredible coordination and the power to not have to relearn how to make a movement, every time. However, whether from a mental, emotional or physical source, maladaptive (more harmful than helpful) patterns of movement and contraction, also are stored in the Sub-Cortex. Consultation for folks first joining the studio or coming back after absence or injury. We will talk about your needs, do a workout and discuss lesson options for continuing. A class geared solely to your needs. Pilates or Yoga. A workout for you and a friend. Pilates or Yoga. For folks who have never been on the CoreAlign® equipment. Free 30 minute test drive. This class will go through some basic meditation techniques including breath work and Maitri. Each technique will be explained and practiced. Spoken words and descriptive images will guide you into a meditative state to relax the body and soothe the mind and spirit. A simple 1/2 hour practice meant to be added onto your daily life. A gentle guided meditation to relax the mind and establish deep communication with your body, mind, health. Explore the Chinese healing art of qigong. Classes incorporate gentle movement, stretching, breathing, relaxation, acupressure and self-massage in order to get the qi flowing. This class is suitable for beginners and all fitness levels. No special equipment is needed. Please wear comfortable clothing that facilitates movement and flat-soled shoes that are reserved for indoor activities – no street shoes, please.